Affiliate Program — SERIAL Magazine. Do you have an audience (an e-mail list, Instagram following, YouTube subscribers, etc) that might be interested in SERIAL Magazine? If so, hit us up! 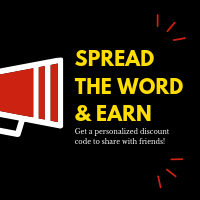 Email editor@serialpulp.com and we’ll provide you with a unique discount code for 20% off that you can share with your audience and in exchange for helping us share the good word, you will receive 20% of all sales as well.